The Presidential campaign is so discouraging with both Donald Trump and Hillary Clinton opposed by a majority of Americans that I recommend the reading of a new book, America's Fragile Experiment (Amazon, $18.99) about the 10 most important patriots of 1800-1865. Quick question: who were those most important leaders? Can you name three of them? Author Roger Turner gives this succinct description of them: "John Marshall, the third Chief Justice of the United States, John Quincy Adams, our sixth President, Andrew Jackson, our seventh President, former Senator and Secretary of State Daniel Webster, James K. Polk, our tenth President, General Winfield Scott, one of America's most brilliant military commanders, the great novelist Harriet Beecher Stowe, Frederick Douglas and Harriet Tubman, former slaves and President Abraham Lincoln, our iconic sixteenth President." Each one were driven by what Turner calls "intense political idealism, morality and religious belief." What were the great contributions of these patriots to the "Fragile Experiment" inspired by the Declaration of Independence and the Constitution? John Marshall was named Chief Justice by President John Adams in 1801 and served 34 years. He swore in his cousin and political foe, Thomas Jefferson, as the third President. He established the Supreme Court as the sole interpreter of the Constitution, which could rule acts of Congress unconstitutional. In effect, he established the judiciary as the third branch of government. John Quincy Adams, son of John Adams, a Founding Father who urged his son to possess "the great virtue of temperance, justice, magnanimity, honor and generosity." When his father was named an emissary to France during the Revolution, John Quincy joined him, learned French and was a favorite of Benjamin Franklin and Thomas Jefferson who negotiated American Independence. He was the U.S. emissary to Russia and was named Secretary of State in 1821, where he persuaded President Monroe to issue the "Monroe Doctrine" which announced that North and South America are "free and independent" and are "henceforth not to be considered as subject for future colonization by any European power." He read through the entire Bible annually. Andrew Jackson made his national reputation by defeating British troops, who outnumbered Americans by 2-1 in New Orleans in the War of 1812. Had he been defeated, America would have lost the entire Louisiana territory. Before he was orphaned at age 13, his mother instilled in him the importance of honesty, self-control, the need for friendship and of believing in himself. He read three chapters of the Bible nightly. When elected President in 1828, he was the first "man of the people." His predecessors were educated landed aristocrats. His election "reinforced the belief that all men, regardless of station in life, could aspire to greater things," even being President. Daniel Webster was a spell-binding orator with a magnificent voice, who closed one Senate speech against South Carolina's threat to nullify federal legislation by saying, "Liberty and union, now and forever, one and inseparable." He bought some slaves to set them free. He translated the entire New Testament from its original Greek. Webster negotiated a compromise that admitted California as a free state and allowed New Mexico and Utah to decide the slavery issue but strengthened the Fugitive Slave Law, making it easier for the South to gain return of escaped slaves. In doing so, he angered his constituents and lost the opportunity to be President. James Polk is considered one of the ten best Presidents because he extended America's borders to the Pacific, enlarging the nation by nearly 40%. How? By defeating Mexico in a war, making the Rio Grande the border, and purchasing California and New Mexico for $15 million. He also finalized U.S. control over the Oregon Territory that had been claimed by the British. General Winfield Scott captured Mexico City in 1847. He defeated a British-Canadian force in the War of 1812. Equally important, he made the U.S. Army a professional fighting force. He also led U.S. troops who forced the Cherokee Indians to move from Florida to west of the Mississippi, in the "Trail of Tears." Finally, in his 80s, Scott advised Lincoln how to defeat the South. Harriet Beecher Stowe wrote Uncle Tom's Cabin that had a transformative impact on America. She depicted the horrors of slavery so powerfully, the book sold two million copies and ended America's seeming indifference to slavery. 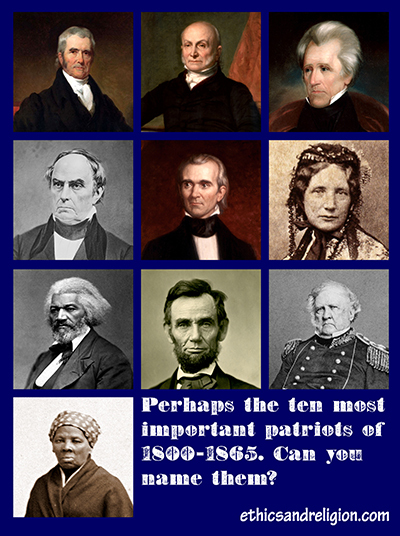 Former slaves Frederick Douglas and Harriet Tubman were powerful speakers who won Northern hearts. However, it was the Civil War, Lincoln's Emancipation Proclamation and the 13th Amendment that ended slavery. As Lincoln put it, "This nation under God shall have a new birth of freedom and shall not perish from the earth." Why don't we have leaders like these? Copyright (c) 2016 Michel J. McManus, President of Marriage Savers and a syndicated columnist. For previous columns go to www.ethicsandreligion.org. Hit Search for any topic.